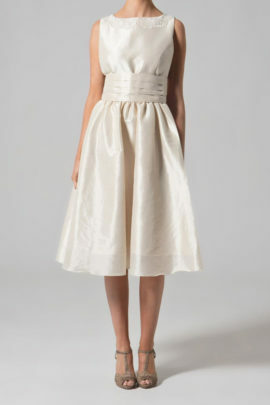 Empire line dress with soft floating chiffon skirts. 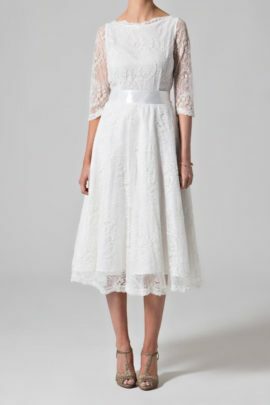 Beaded lace bodice with flattering cap sleeves and pearl buttons. 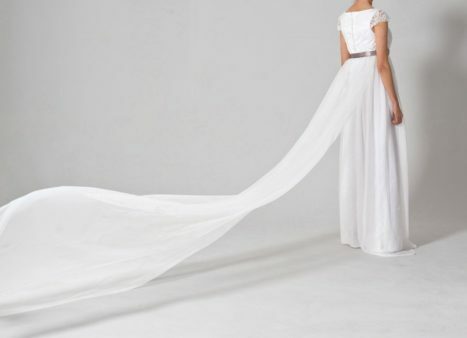 A dramatic tulle train is draped from the satin waistband. Darcy is a flattering empire line dress with a fitted bodice and gathered skirt which skims the body. The fitted lace bodice is made from a delicate beaded French lace. A discrete sparkle is given by the glass and pearl beads as they reflect the light when moved. Sheer lace cap shelves with a scalloped edge complete the look. The back of the dress closes with pearl mushroom buttons. 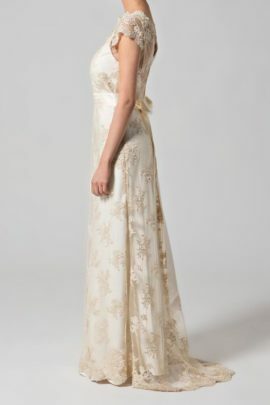 A satin ribbon waistband highlights the waist with a detachable train attached. The tulle train is adorned with hand stitched flowers at the end. Chiffon gathered into the bust line flows beautifully when you walk. This is a very comfortable dress to wear.